The Enemy of my Enemy is my … | evolveit! 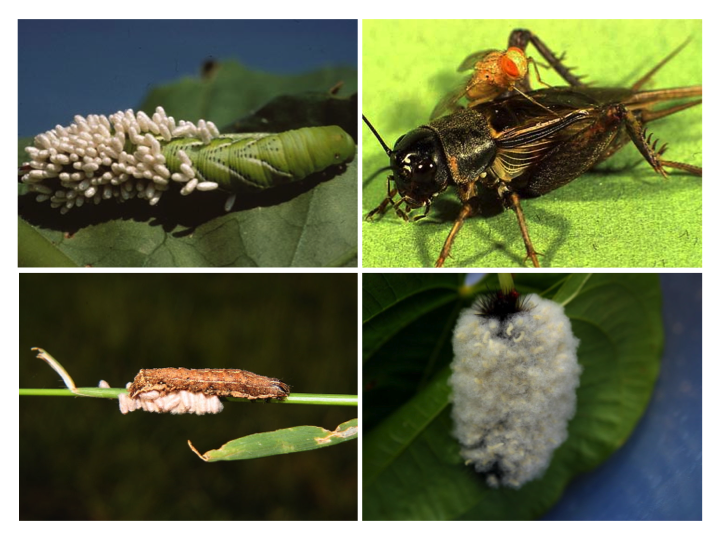 Parasitoids are an especially gruesome type of parasite that spend part of their life attached to or inside a host organism. They differ from other parasites because they inevitably kill or sterilize their host. For example, parasitoid wasps reproduce by laying their eggs inside of the body of a host insect. The eggs then hatch and the larvae consume their host from the inside out as they grow and develop, until ultimately they emerge, killing their host “Alien“-style. A recent paper published online at the Journal of Evolutionary Biology, investigates a particularly interesting case in which a parasitoid wasp, Leptopilina boulardi, is in turn infected by a virus, LbFV, that manipulates the wasps parasitoid behavior. L. boulardi, are tiny parasitoid wasps that lay their eggs inside of fruit fly (Drosophila) larvae. Each Drosophila larvae contains enough resources to support the development of only one parasitoid wasp. If more than one egg is laid inside of a single fly larvae, referred to as superparasitism, severe competition ensues and only one young wasp will emerge. As a consequence, female wasps rarely lay eggs inside of a previously parasitized larvae. However, this severely limits the opportunities for the transmission of a virus, Leptopilina boulardi Filamentous Virus (LbFV), that infects these wasps. As a result, LbFV does something really sneaky. 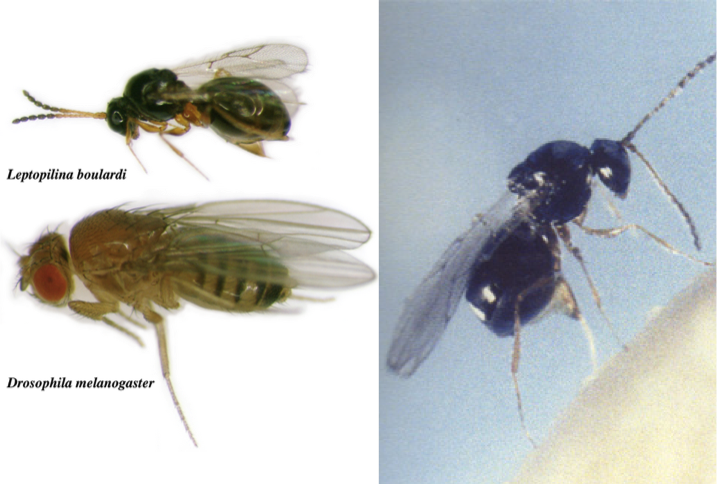 The photo on the right shows a female L. boulardi laying an egg in a Drosophila larvae. LbFV is transmitted vertically from infected mother’s to their offspring. However, when only one offspring is present inside a host larvae, horizontal transmission between infected and healthy wasp larvae is very limited. In order to increase the rates of horizontal transmission, the virus actually manipulates the behavior of the female wasp so that she will no longer avoid laying her eggs inside of previously parasitized hosts, and in doing so subject her offspring to harsh competition and lower survival rates. As such, Martinez et al. (2011) hypothesized that L. boulardi should be under selection to evolve resistance to the behavioral manipulations of the virus. With this in mind, the authors used adult wasps collected from five different populations in France that vary in the frequency of the virus and asked three questions. First, the authors collected data to confirm their assertion that infection with the virus causes higher rates of superparasitism. To do so, the authors measured the rate of superparasitism (the average number of wasp eggs per Drosophila larvae) among infected and uninfected females from the five populations. They found that infection with the virus did cause a strong increase in the rate of superparasitism, which ranged from an average of around 1 to 11 eggs per larvae among the compared groups. Statistically, infection by the virus accounted for 77% of the variation in superparasitism rate. This indicates that the virus is the major factor influencing superparasitism rate, but that there is also some variation in the tendency to super parasitize that is independent of the effect of the virus. Second, in order to determine whether resistance to behavioral manipulation by the virus has evolved, the authors compared the rates of superparasitism by infected females from the five different populations. The results confirmed that the populations of parasitoid wasps varied significantly in their tendency to super parasitize when infected by the virus. However, in order for the trait to evolve this variation must also be heritable. Using methods that I will not describe here, the authors show that the variability appears to arise from heritable genetic differences. Third, after identifying heritable genetic differences in susceptibility to the effects of the virus the authors wanted to determine whether this observed variation was due to differences in resistance to the virus or tolerance to the effects of the virus. For example, if the wasps immune systems vary in the degree of resistance to infection by the virus, then the observed differences in behavior could result from variation in the ability to fight off viral infections. If this is the case, we would expect to see a higher density of virus particles inside wasps exhibiting the highest rates of superparasitism. However, the variation in behavior could also result from tolerance to the effects of the virus, such that the density of the virus within a host does not correlate with the induced behavior. After measuring virus titres within females from the different populations, the authors confirmed that the virus density (or titre) did not differ among the compared groups, which supports the hypothesis that the wasps differ in their tendency to superparasitize due to genetic differences in their tolerance to manipulation by the virus. If you have stayed with me so far, you may be wondering why I mentioned earlier that the authors of this paper collected wasps from five populations that differed in the frequency of the virus. This is because, the authors had an additional prediction that the strength of selection for resistance to the virus’ behavioral manipulation would be the highest in populations where the virus is most common. Thus, if there is heritable variation for the trait, which they demonstrated, then populations with the highest frequency of the virus should show the lowest rates of superparasitism among infected females. However, such a correlation was not observed, thus providing an interesting question for future research.